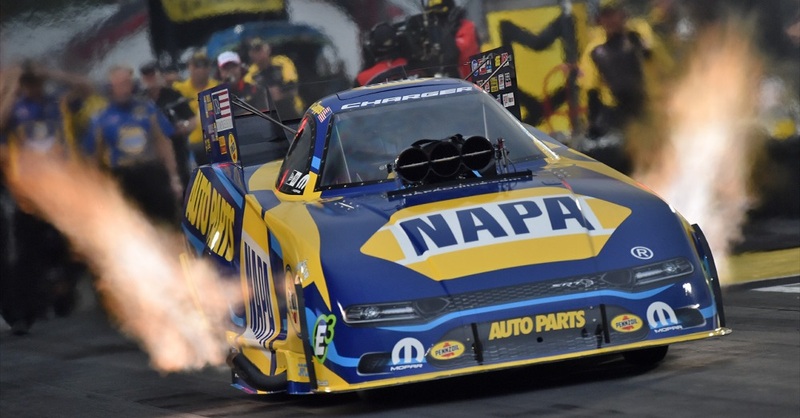 After the NAPA Dodge Charger was eliminated in the last round of the semifinals at the New England Nationals, Capps and the NAPA AUTO PARTS Funny Car team are looking for that lucky charm to get them back into the NHRA winner’s circle. EPPING, N.H. (June 23, 2013) – Last Sunday at Bristol (Tenn.) Dragway, if Ron Capps and his NAPA AUTO PARTS Funny Car team had any luck it was bad luck. A broken throttle cable clip ended the team’s day early in round one. Fast forward a week later to the inaugural New England NHRA Nationals in New Hampshire and Capps and his Rahn Tobler-led team flashed the form that took them to five race wins in eight final rounds last season. The NAPA AUTO PARTS Dodge Charger R/T qualified in the No. 4 position at New England Dragway, his second best start of the ’13 season after earning the No. 2 spot at Atlanta Dragway last month. 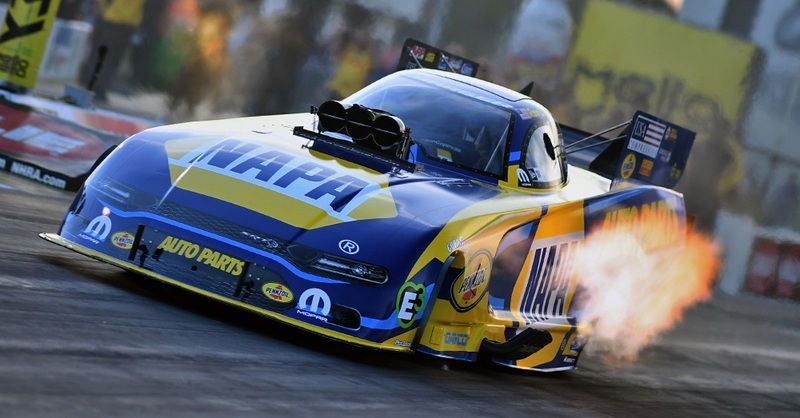 On race day at the NHRA’s inaugural New England bash, the NAPA car posted the quickest elapsed time of round one at 4.084-seconds, followed by a solid run of 4.118-seconds to defeat 2011 NHRA Top Fuel champion Del Worsham in round two. 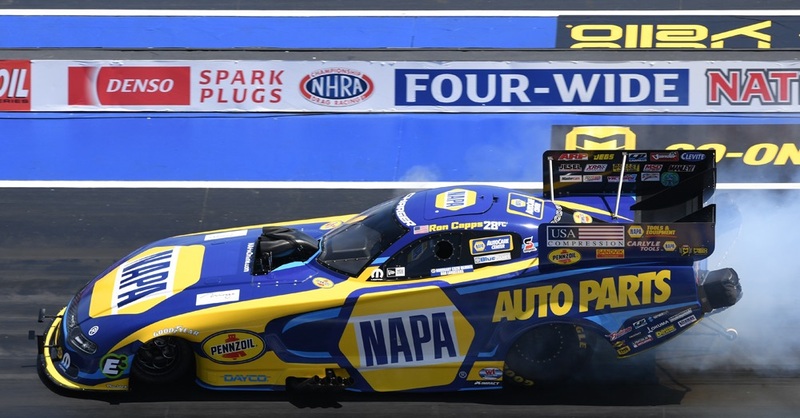 Squaring off against 15-time NHRA champion John Force in the semis, the NAPA flopper lost traction at the hit of the throttle as Force earned the trip to the final round at 4.144-seconds. It was the 68th career meeting between Capps and Force and only the second time that Force has beaten Capps in the last 10 meetings. “This is a tough race track for people to adjust to because it was so good,” Capps said of the all-concrete strip at New England Dragway. “We didn’t expect the track to be this good. Even though we had some humidity and some heat, it made it quite the challenge for the crew chiefs. I do nothing but brag about (Rahn) Tobler and (assistant crew chief) J.C. (John Collins) because we adapt so well. Capps and the NAPA Batteries/Intrepid Fallen Heroes Funny Car team hope that luck continues for two more win lights next Sunday at Route 66 Raceway near Chicago. The 2005 winner of the fall NHRA race at Joliet hopes to collect another Wally trophy from team owner Don Schumacher’s home race track. Join us next weekend at the 16th annual Route 66 NHRA Nationals in Joliet, Ill., June 28-30. 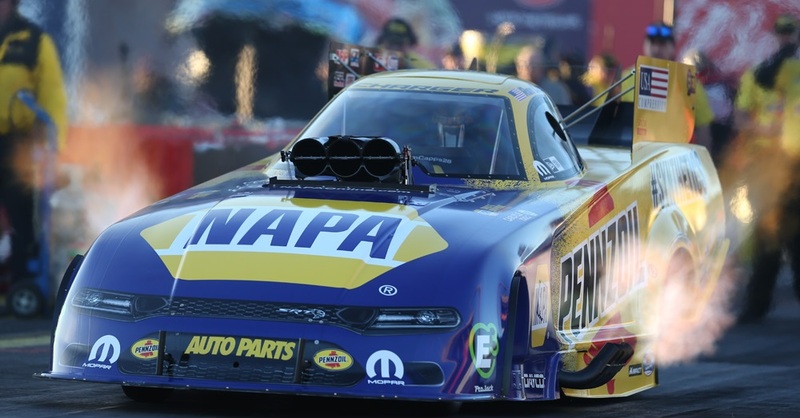 Or, watch it Sunday on ESPN2 and cheer on Ron Capps and the NAPA AUTO PARTS Funny Car team.